An international team, led by DTU Space at the Technical University of Denmark with Colorado State University, has found that the bedrock below the remote West Antarctic Ice Sheet is rising much more rapidly than previously thought, in response to ongoing ice melt. The study, "Observed rapid bedrock uplift in the Amundsen Sea Embayment promotes ice-sheet stability," reveals new insights on the geology of the region and its interaction with the ice sheet and is published in the journal Science. The authors noted that the findings have important implications in understanding and predicting the stability of the ice sheet and Earth's rising sea levels. "We studied a surprising and important mechanism, glacial isostatic adjustment, that may slow the demise of the massive West Antarctic Ice Sheet by lifting up the bedrock and sediments beneath the ice sheet," explained CSU Professor Rick Aster, a co-author of the study and head of the Department of Geosciences at the university. Scientists have been concerned that this ice sheet is particularly precarious in the face of a warming climate and ocean currents, because it is grounded hundreds to thousands of feet below sea level — unlike the ice sheets of East Antarctica or Greenland — and its base slopes inland. This bowl-like topography makes it susceptible to runaway destabilization and even complete collapse over centuries to thousands of years. The entirety of West Antarctica contains enough ice that, if it were to melt, would contribute more than 10 feet of average global sea level rise. In addition, the ice sheet is so massive that it gravitationally attracts an ocean bulge that, if released, would lead to an additional increase of three feet or more to sea level in parts of the northern hemisphere. Co-authors of the study based at The Ohio State University led the installation of sensitive GPS stations on rock outcrops around the remote region to measure the regional uplift of the Earth in response to the thinning ice sheet. Measurements showed that the bedrock uplift rates near the coast of West Antarctica were as high as 1.6 inches per year, one of the fastest rates ever recorded in glacial areas. "This very rapid uplift may slow the runaway wasting and eventual collapse of the ice sheet," said Aster. "The uplift tends to stabilize the critical grounding line where the ice sheet loses contact with underlying bedrock or sediment and goes afloat," he explained. 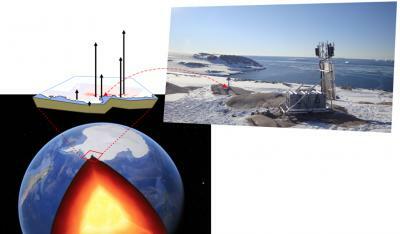 This grounding line then counteracts the process of the ice sheet collapsing. Researchers also found that the uplift is accelerating and predicted that it will continue to do so into the next century. "Our research indicates that recent and ongoing ice loss in the region has been underestimated by approximately 10 percent in past studies, because this bedrock uplift was inadequately accounted for in satellite measurements," said Aster. Lead author Valentina Barletta, a postdoctoral researcher at DTU Space, Technical University of Denmark, said that this uplift is occurring very rapidly, when compared with other regions of the Earth where glaciers are melting. "Normally we would see this type of uplift happening slowly, over thousands of years after an ice age," said Barletta. "What we found tells us that Earth's underlying viscous mantle is relatively fluid and flows relatively quickly when the weight of the ice is taken off," she added. Terry Wilson, professor emeritus of Earth Sciences at The Ohio State University, said the rapid rise of the bedrock in this part of Antarctica suggests that the geological conditions beneath the ice are very different from what scientists had previously believed. "The rate of uplift we found is unusual and very surprising," he said. "It's a game changer." Aster, Barletta and the study co-authors have also deployed a large network of sensitive seismographs across Antarctica to produce seismic tomographic images — analogous to a gigantic CAT scan — of the deep Earth below Antarctica. This work assisted in the interpretation and modeling of the GPS uplift data by providing detailed mapping of a vast region of Earth's mantle up to 400 miles below West Antarctica. "These warmer mantle features drive the previously enigmatic volcanic activity in West Antarctica, including Mount Erebus on Ross Island," said Aster. "This geothermal heat at the base of the ice sheet helps to sustain subglacial lakes in some regions and lubricates the ice sheet as it slips towards the ocean," he added. Aster said that while the research does provide room for a positive outcome, if future global warming is extreme, the entire West Antarctic Ice Sheet will still melt. "To keep global sea levels from rising more than a few feet during this century and beyond, we must still limit greenhouse gas concentrations in the atmosphere, which can only occur through international cooperation and innovation," he said. US methane emissions greater than thought, in recent years?